Are you ready to generate more growth in your business? Do you want to spend more time working ON your business, instead of IN it? Would you like more money, time, satisfaction and freedom from your business? 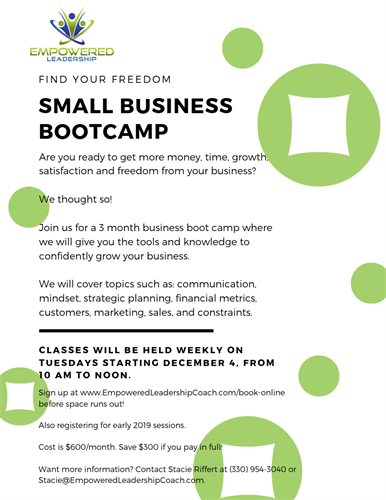 We know small business owners have limited resources (time, money, and manpower), which is why we designed this business boot camp just for you. We want to help small business owners maximize their growth, get more from their business, and gain more freedom. 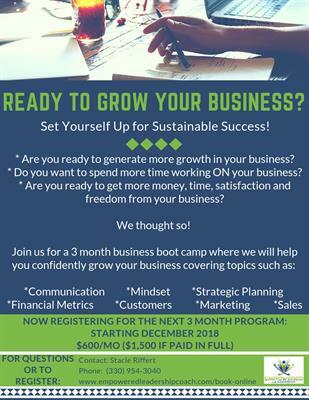 Join us weekly for a 3 month course where we will give you the tools and knowledge to confidently grow your business. We will cover topics such as: communication, mindset, strategic planning, financial metrics, customers, marketing, sales, and constraints. Let us help you give your business the boost it needs! We will meet for a total of 9 sessions over the 3 months. The cost is $600/month or a discount to $1,500 if you pay the entire amount in full. Registration is now open for the next sessions. We are currently enrolling for December, January and March.